Tsavorite or tsavolite is a variety of the garnet group species grossular, a calcium-aluminium garnet with the formula Ca3Al2Si3O12. Trace amounts of vanadium or chromium provide the green color. Green grossular had been rare until 1967, when British gem prospector and geologist Campbell R. Bridges came across a deposit of the mineral in the mountains of north-east Tanzania. The specimens he found were of very intense color and of high transparency. The find interested the gem trade, and attempts were made to export the stones, but the Tanzanian government did not provide permits. Believing that the deposit was a part of a larger geological structure extending possibly into Kenya, Bridges began prospecting in that nation. He was successful a second time in 1971, when he found the mineral variety there,and was granted a permit to mine the deposit. Until 1974, the gemstone was only known to mineral specialists; in that year Tiffany and Co launched a marketing campaign which brought broader recognition of the stone. The name tsavorite was proposed by Tiffany and Co president Sir Henry Platt in honor of Tsavo National Park in Kenya. Apart from the source locality in Tanzania it is also found in Toliara (Tul�ar) Province, Madagascar, but so far, no other occurrences of gem material have been discovered. Rare in clean gems over 1 carat (200 mg) in weight, tsavorite has been found in sizes yielding up to 15 carat (3 g) stones. Recently a find of Tsavorite garnet in Arusha, Tanzania produced one of the large faceted Tsavorite garnets cut in a mixed oval weighing in at 120.68 carats. 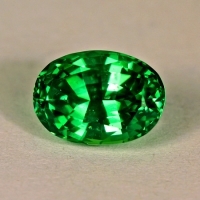 Late in 2006 a 925 carat facet grade crystal was discovered it yielded an oval mix-cut jewel of 325 carats and is the largest know faceted tsavorite garnet to exist. Tsavorite garnet is a hard durable jewelry gemstone that takes a very good polish making them a good less costly alterantive to emerald. They have excellent brilliance and are a very clean gemstone. 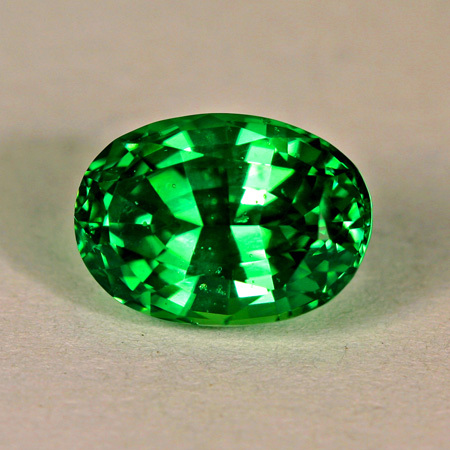 Tsavorite garnet is a January birthstone. Vivid intense green color. Excellent cut and polish. VS, eye clean clarity.